While the terms Web server and Applications server are often used interchangeably to relate to the same thing – that is to facilitate proper functioning of a website, but they are not the same thing. Rather, they work in conjunction to deliver content from websites to the end users. A web server may refer to a program that accepts and fulfills incoming requests from clients for web resources over the World Wide Web. It serves those requests along with optional contents which usually are HTML pages, image files, video files, etc. 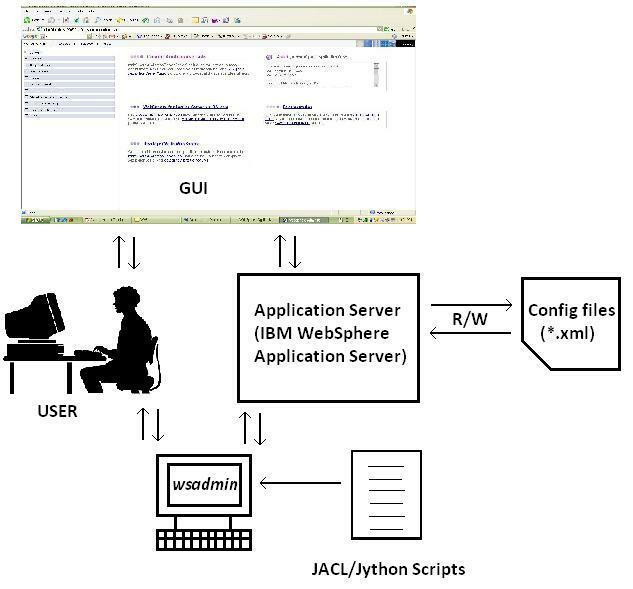 An application server serves dynamic content to the end users using different protocols including HTTP. This article explains the difference between the two. A web server is nothing but a software program designed to handle web requests. It accepts incoming requests in the form of static content which is basically the components of a website including HTML pages, image and video files, etc. It then responds to the requests over the HTTP protocol along with optional data contents. The main job of a web server is to serve contents to the World Wide Web to make them accessible for the end users. It may refer to a system comprised of hardware or software, or both where the web contents are stored. In simple terms, web server is a computer that delivers web pages as and when they are requested. Apache is the most popular and widely used open-source web server developed and maintained by Apache Software Foundation. Application server is a term that is often mixed with a web server except it may employ various strategies to process requests initiated by the web server. It facilitates the hosting and delivery of high-end business applications. It is often viewed as a three-tier application comprised of a GUI (Graphical User Interface), an application server, and a database and transaction server. It serves business logic to application programs through various protocols including, but not restricted to, HTTP. It’s a software framework which provides all the facilities required to create and run both web based and enterprise based applications. Rather than serving static content, it is best suited for serving dynamic content and transferring applications from one device to another. Web server refers to hardware or software, or both, that delivers content or services to the end users over the World Wide Web. It’s more like a program that respond to the incoming network requests for web resources over the HTTP protocol. It is also known as an internet server. Application server, on the other hand, is a component-based software framework which facilitates development and running of web-based applications. Basically, it’s a middle-tier server program designed to provide business logic for application programs. Web server is limited to only HTTP content, meaning it only uses the HTT protocol to store, process, and deliver content to clients. It is a powerful computer that makes websites accessible over the internet and the communication between the client and the server is done using HTTP. Application server is not just limited to sending static HTML content; in fact, it transfers business logic to client applications using several protocols. The job of a web server is to accept and respond to the requests of the users which are forwarded by their computers’ HTTP clients which can be either from a web browser or a mobile application. The main purpose of a web server is to make the static content accessible for the users to view on the web browsers. The job of an application server is to host and expose business logic applications and processes using several different protocols. It works in conjunction with the web server. Web server responds to requests coming from more than one connection at a time but is not able to process multiple simultaneous requests in parallel. The idea of using threads to improve computational speed simply does not work with web servers. Application servers, on the other hand, support multi-threading along with several other features such as isolation pooling, connection pooling, load-balancing, clustering, etc. Web server is based on internet and intranet related programs to serve email, download requests for FTP files, and build and publish web pages for clients using the HTTP protocol. It may be used alone or as a component in an application server. Application servers, on the other hand, can do everything app servers are capable of and more. They are more capable of creating dynamic content to serve both web applications and enterprise based applications. Web servers play a fundamental role in how the internet works without which the internet ceases to exist. In simple terms, Web servers act as a gateway between the user and the World Wide Web. It’s a system designed to serve static content to the end users through the internet. It’s limited to serving clients’ request only through the HTTP protocol. Application servers, on the contrary are more resource intensive that provide middleware services to client applications through various protocols including HTTP. It’s a framework designed to install, operate and host applications and services for end users. While both are essential for a website to function correctly, they are very different from each other. Sagar Khillar. 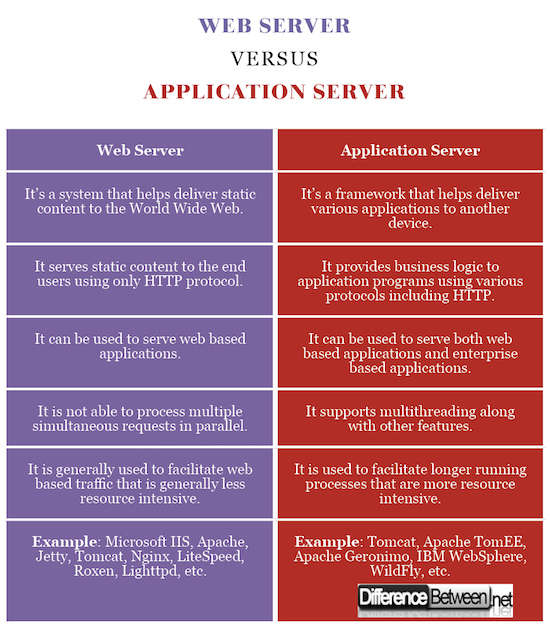 "Difference Between Web Server and Application Server." DifferenceBetween.net. June 12, 2018 < http://www.differencebetween.net/technology/difference-between-web-server-and-application-server/ >.